Get 6% off on orders over $59 with Code: AFF6. Get 10% off on orders over $89 with Code: AFF10. Get 12% off on orders over $99 with Code: AFF12. Get $20 off on all orders above $199 with Code: AFF20. Get $30 off all orders above $299 with Code: AFF30. Get $40 off on all orders above $399 with Code: AFF40. 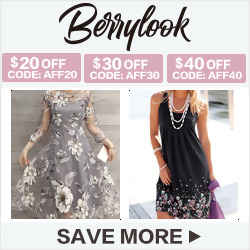 Found a coupon for BerryLook?